aLegendWai: Would anyone mind to tell me what's the point of playing b? To me, I tend to feel a is better than b. b leads to a possible peep later on which seem to be quite serious. Now the two marked stones form a Chinese relationship, whereas if the extension was at a, it would look somewhat inconsistent with the komoku stone. Note that this is quite similar to the diagram given below, where B has already approached the upper right, but I think it's worth noting that the relationship of the marked stones is good, with or without an approach in place. aLegendWai: That recalls me about the occurrence of four-space jump in one game. The commentary said it was regarded as too wide in general. But since the player wished to keep good co-operation with another friendly stone, so it plays one-space wider in this case. B at a is a potential peep. 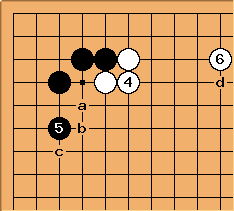 Bob McGuigan: It seems to me that Black would rarely play this peep after the circled black stone has been played because it is likely not to be forcing. 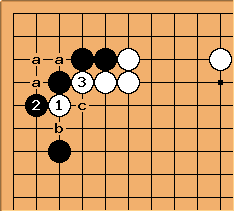 The peep at a is an old joseki move, but it is played before and followed by the diagonal move at the point marked with a square if White connects. This way is better for further Black development on the left side. aLegendWai: Thanks, Bob. Sorry about the misleading diagram (Diagram redrawn). What I would like to point out is the potential weakness of the peep. Yes, B shouldn't played this out instantly. Alex Weldon: If you read Bob's comments more closely, you'll see that he's saying that it's not that B shouldn't play it instantly... it's that if B does want to peep, he will play it before . If B plays and tries to peep later in the game, W will likely tenuki. aLegendWai: Oh I see. My reading ability is fading :P Just like my Go reading ability - often make silly mistakes. If the circled stones are on the board then Black has a possibly severe invasion at a which would not be available if Black had peeped and White had connected. aLegendWai: Sorry that this may be a stupid question. How can Black invade at a? Alex Weldon: There are no stupid questions, and this is a good point about shape. This position will be familiar to some. It appears elsewhere on Sensei's. 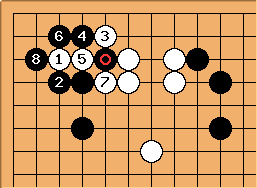 What I want to point out is the relationship of the marked stones Whenever this sort of shape appears on the board, one should look at , because it is likely to be a serious weakness (not always, of course). The reason being that if , connects, because B b fails to cut off because of W c. If W has a continuation on the left side so that B at 3 or c instead is no better, then the invasion will be successful. aLegendWai: It seems to be quite common in handicap games. The following is just my little opinion. You may disagree with it. I think playing at b is okay (Thanks to the special properties in the corner). It is not easily noticed. And it seems this variation is the best for B to keep most territories in the corner (if it is its aim!). Alex Weldon: Yes, this is correct, but beside the point, and covered on another page. I shouldn't have said that B can't play b, just that he can't cut off W's stone. Anyway, I've adjusted my comment above, and now we should remove these diagrams, as they're off-topic. aLegendWai: You may leave it as a comparison between this shape defect in the corner and that on the side. So this shows the shape defect becomes serious as it moves outside. Anyway, it is up to you to delete or not. If you treat the stone lightly, the option b is possible. Bill: b is vastly superior to a. If Black plays at b, does White now play at a? Also, please edit this. It looks like the diagram and comment are Alex's, which cannot be. aLegendWai: By the way, it may be a good idea to block on the other side (the one which allows B to live in the corner. It seems to be a loss. But the side W group will be in great danger. And B will gain eventually. Here, the relationship in the marked stones is similar. The stand in the other example is missing, but B has drawn back at instead, so the weakness is still valid. 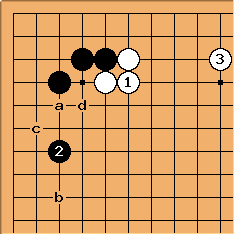 If W presses down on top with , B can connect under with . I'm not sure whether the exchange of for is good for B to make first. Someone strong want to comment? On the other hand, W could prevent B from connecting with something like (or a, or b). One possible move for B then would be . Now we see why is important; as B runs out, comes under attack. If was strong, this sequence would just burden B with a weak group. aLegendWai: Thanks a lot, Alex Weldon. It's really an excellent piece of explanation. I fully get the idea. :P Thanks a lot. DJ: I am afraid in the diagram above is not the best answer to Black's severe invasion. 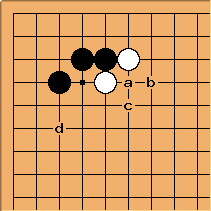 White's answer on top of the black invader (Possible sequence 1) is even worse for white: she has given up almost all of the upper-side territory without getting any compensation: the white stones have no power to speak of, being squashed against thick territory and surrounded by strong black position everywhere. 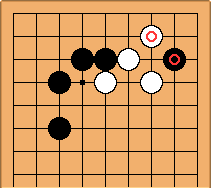 As I said, the invasion is severe: therefore, once Black plays , White usually defends at z in the diagram below: we will see later how a stone here will make it difficult for Black to invade. Anyway, the correct answer to the black invasion at is below. 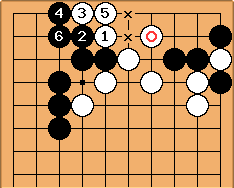 is the shape tesuji: such a move can be used to stop the opponent from connecting in a variety of similar situations. If you think that in the dia below (the "wrong" answer to the invasion) is good because it allows the monkey to jump, well, think twice: if we consider the standard outcome of a monkey jump and we compare it with the dia above, Black is worse off by two points, but so is White. Moreover, if Black finds the time to block before the monkey jumps (for instance at ? ), White doesn't have any sente sequence. Baaaaaaaad! DJ: I have moved Legend's questions to another page, because they broke the flow of my comments and diagram, making everything uncomprehensible. I will try to answer there. Now, what happens after White has played ? Black plays below. 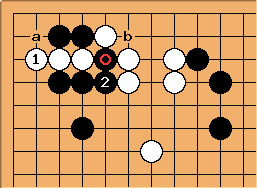 Now White a is bad as Black pushes up at b, while White b is bad as well, as Black c, makes miai of connecting at a or escaping at d.
Therefore the whole sequence is as follows. defends against an attempt to cut at a, White 11 is at (note that this is where White should have defended in the first place). aLegendWai: In fact, I don't know know where to learn middle-game joseki. Is there any website/source talking about middle game fight? Dear Legend, there was once a booklet by Takemiya called "Enclosure Josekis", but it is out of print. What I would suggest is to study Tesuji and Tsumego, play along pro games amd forget about joseki's until your are 3D. See my pageA Zen way to Joseki. - Goes closer to help White's extension stone. You can see that is better placed to deny Black any territory in the b area, while if was at a Black could play himself and get points there. kokiri: I guess rather than a is a bit quicker, but less solid, so you might play it to get about the board a bit quicker. Personally I would play it in a situation like this, where extending one stone further allows me to pincer the stone. I would like to know why the point c is too wide. What weaknesses the point c leaves? And how can we exploit? Rich: It can be played; however, the point a is vulnerable. In the joseki, white has a secure corner, and a solid link to the left-hand side - he can then extend further down the side later. The two-space jump has a weakness at a which may cost the corner or the connection to the side; furthermore, it makes a later black move at b more threatening, with the potential to follow-up at c, say. It's more a question of aji and later potential than something that should necessarily be immediately punished. 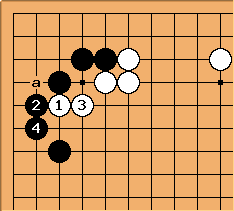 There's a good section in Kageyama's Lessons in the Fundamentals of Go, explaining (referring to a 3-3 joseki) why some joseki seem quite modest in their moves; early solidness can be a source of later strength. aLegendWai: It is my little opinion. You may or may not agree. As a note, the weakness at "a" seems not that serious. A instant punishment will not get good results either. But it may be a potential weakness we may exploit later. Let's see why "a" is not serious. Alex Weldon: It is very, very difficult to explain aji. I guess what you have to understand is that, as the diagrams below indicate, there are lots of options W has for playing sente moves against B's position. None of them gain much if played immediately, but the point is that if W keeps those options open, sooner or later, something might happen in the vicinity that makes one of them work. I think the easiest to appreciate is White at b in the diagram above. If W can arrange to get a stone there in the natural flow of play, B will have weaknesses in his corner that he has to worry about. Consider also that going one line further doesn't really get B much more. 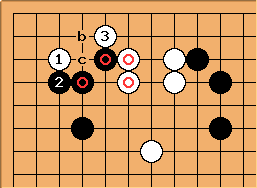 An attachment at a in the endgame will press B down, so his territory will be about the same as with the short extension, and the aji of W b means that going one line further doesn't actually give B's position more influence down the left side (if it was influence he was after, d instead of would be the right choice anyway). So even if you don't consider the weaknesses severe (and they aren't game-breaking, just a nuisance to worry about), realise that unless there is some special circumstance on the left side, B is introducing aji into his own position without getting anything in return. aLegendWai: You explain well. Not difficult to understand. Thanks a lot. The 2 W stones got stuck in. It is bad to W.
It is better than variation 1. In fact, the above variations seems thank-you moves. I feel we should leave this weakness open. That means we should not played the sequence out. aLegendWai: I think of some more. This is the first one. But Rich is ahead of me to post it first. B's next may be "a" or "b". "a" seems bad. aLegendWai: It is the outside hane. B's next may be "a" or "b" or "c". aLegendWai: aims at the weakness at 3-3. B's next may be "a" or "b" or "c". Alex Weldon: I think might be aji-keshi, since it will induce B to fix his weakness.